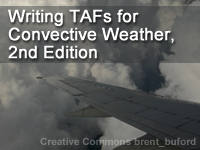 "Writing TAFs for Convective Weather, 2nd Edition" uses a severe thunderstorm event to illustrate techniques for producing an effective Terminal Aerodrome Forecast (TAF) following current National Weather Service directives. The unit offers guidance for developing TAFs for different types of convection and discusses how to concisely communicate logic and uncertainty in an aviation forecast discussion (AvnFD) or by other means. It also addresses the importance of maintaining an effective TAF weather watch and updating the TAF proactively. The only thing that tripped me up was the word "thundershower". No such word in meteorology. Some information needs to be updated to meet the latest TAF/aviation standards. Otherwise, a good overview on developing TAFs for convective weather (a challenging topic). This module is very interesting but very tricky. Needs time to understand. The lesson is very educative and interesting too, though i would like it to include more examples from other parts of the tropics such as in Africa. Determine how general convective hazards (e.g., lightning, strong winds, heavy rain, reduced ceiling/visibility, or hail) might impact airport operations. Describe how the unique characteristics of each convective type relate to creating a TAF. List the strengths and weaknesses of using BUFKIT, AMDAR, AWIPS Time-of-Arrival (TOA)/Lead Time, and other special tools for creating a TAF for convection. Explain why the TAF writing procedure needs to be revised for convection and why the use of special tools is so important for this process. Produce a practical TAF for a mesoscale convective system, air mass thunderstorms, supercell thunderstorms, or microbursts. Effectively articulate forecast logic and uncertainty about a TAF in an Aviation Forecast Discussion (AvnFD). Ensure a TAF is consistent with other forecast products from both the local office and national centers and explain how the Terminal Aerodrome Forecasts Directive impacts the TAF building process for convective weather. Use a weather watch to proactively issue weather product updates. Identify when coordination is necessary for the TAF and with whom it should be conducted. January 2014: This lesson replaces the previous module "Writing TAFs for Convective Weather" to align the content with NWS Directive 10-803. The case study has been updated to a more thunderstorm event affecting Atlanta International Airport. The available data products section has also been updated.